So You Wanna Try Deep Learning? Is HBase’s slow and steady approach winning the NoSQL race? "Andrew Gelman is a top researcher in Bayesian statistics as well as an excellent writer. He has written an excellent text on Bayesian data analysis that uses the Markov Chain Monte Carlo methods for dealing with hierarchical linear models. 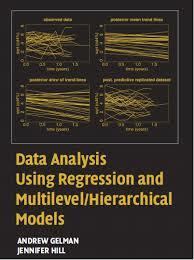 This book starts out on an introductory level covering a wide variety of statistical modeling problems including logistic regression and multilevel logistic regression, generalized linear models and causal inference..."